The Personal Best Triathlon Training camp. Our training camp is based at The Hotel Beau-Soleil in Cesenatico, Italy. Cesenatico is situated on one of the stages of the Tour of Italy cycle stage race; the Nove Colli, the nine hills –which says just about all there is to stay about the terrain! Cesenatico was also the home town of Tour de France winner Marco Pantani. The hotel has its own 6 lane, 25 metre heated outdoor swimming pool for our use on site; the hotel is also –quite literally- just two minutes walk through the woods to the beach. The woods themselves have a 5km Pine Running Trail marked out. The majority of our run training sessions take place in the woods. The Hotel Beau Soleil is a dedicated sports hotel, and is owned and run by ex-professional cyclist Dante Delvecchio and his family. The hotel rooms are clean, comfortable and all have their own en-suite shower and toilet. The food is excellent with an enormous continental breakfast on a serve yourself basis; all you can eat with cereal, yoghurt and fruit and rolls with the usual tea, coffee and hot chocolate. Evening meals have a choice of ‘help yourself’ salad buffet starters, and choice of four main meals and deserts. There is secure cycle storage and workshop in dedicated areas at the hotel so there is no need to take up precious bedroom space with the bikes. There is also a small gym and massage facility. In early season, March – June, 90% of people staying in the hotel will be Triathletes or Cyclists from Austria, Switzerland or Germany, training for the forthcoming season. It has become very popular with the British cyclists and triathletes, many of them taking part in the Nove Colli ride over distances of either 130 or 210 km. 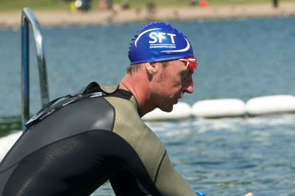 The Personal Best Triathlon training camp is the perfect way to start the season whether you are an International athlete, a novice or a middle of the packer. All the normal triathlon training sessions on cycling, running and swimming (including open water), plus yoga and stretching. There is the opportunity to train all day if you want….or to take it just as easy as you want to. Limited places available. ONLY 6 places left !! Price includes flight, accommodation, transfer to hotel, breakfast and evening meal, coaching, facility use. I know that many of you will have been on a previous warm weather camp to Italy or Malta and will have experienced the level of coaching that we can offer including DVD/video feedback as part of our coaching services. We film and feedback individual swim technique almost every day. We also have a masseur on site throughout.